The lovely azalea, a member of the rhododendron family, is a standard feature of the home garden. Blooming in spring, it brightens the landscape with its lush, abundant blooms. Azaleas are acid-loving plants and do best in soil with pH between 4 and 5.5. Iron, a necessary nutrient, though abundant in many soils, is still not available to azaleas unless the soil has proper acidity. Many factors affect soil pH. A look at pH starts with a look at the basic structure of the soil. Soils with high amounts of organic material like leaf mold or peat tend to be acidic with a low pH. Soils high in sand, chalk or volcanic ash tend to be alkaline with a high pH. If you are not sure of your soil's pH, get a soil test done with your agricultural cooperative extension office. Soils high in chalk, ash and other alkaline ingredients will have to be amended before azalea planting can begin. Use compost, composted manure, peat moss and leaf mold to lower pH of existing soil. You may have to move some of the existing soil to another part of the yard. The need to raise pH for azaleas is very unlikely, but soils with pH of less than 4 can be amended with chalk and lime to raise pH. Many good fertilizers are formulated for acid-loving plants. 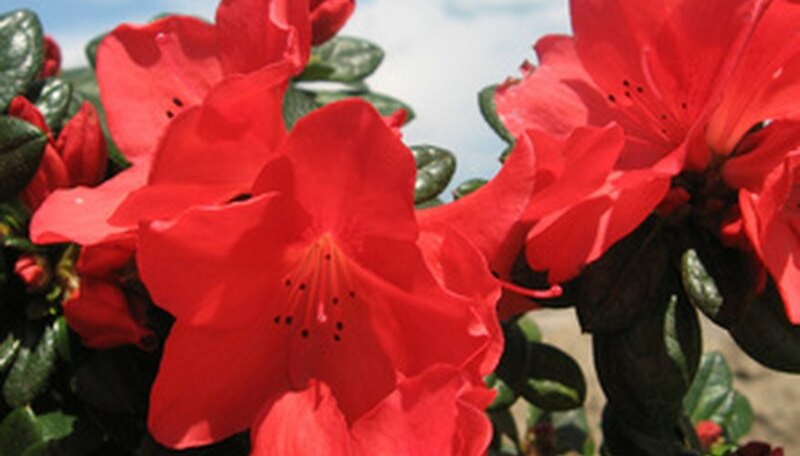 Look for an all-purpose acid-loving fertilizer or one specially made for azaleas and rhododendrons. These are slightly acid and help moderate alkaline soil. Mulching is an important aspect of soil conditioning. Organic mulch breaks down over time, adding its organic goodness to the soil and moderating pH. Replenish mulch every spring. Never use crushed limestone or marble as a mulch for azaleas because it will raise pH. When pH is too high, leaves turn pale green or yellow. This is chlorosis, caused by iron deficiency which is facilitated by high pH. The best long-term solution is an application of iron sulphate or sulphur. For a quick shot in the arm, a foliar application of chelated iron will turn leaves green quickly. Follow all product instructions. In the unlikely event that soil is too acidic, you will see a general decline. The solution is an application of lime. This is also a good time to get a soil test to pin down pH needs.